Chocolate Raspberry Thumbprint Cookies – who can resist the classic combination of raspberries and chocolate?! 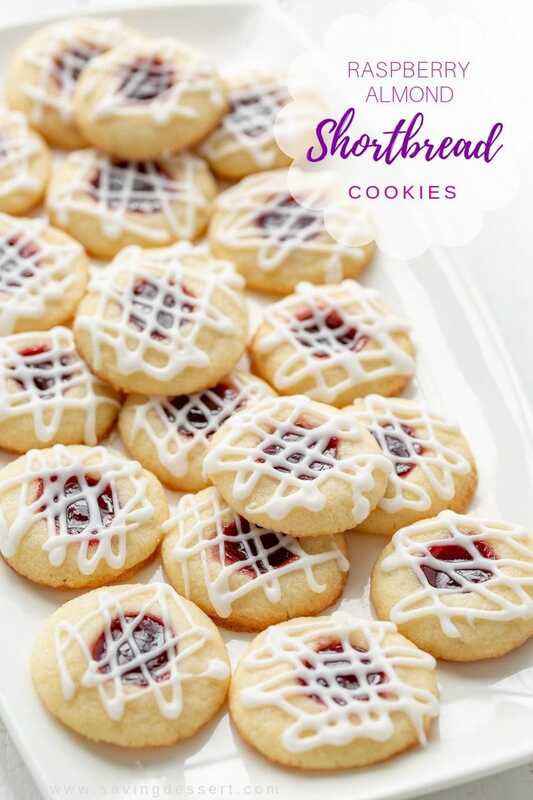 This little cookie boasts plenty of chocolate flavor and a fun little heart shaped thumbprint filled with seedless raspberry jam. An easy and delicious cookie with a Valentine’s Day theme. First, it’s hard to believe but Valentine’s Day is just a few weeks away. I’m not a big fan of “Hallmark holidays,” but Valentine’s Day can be fun, especially for kids. I’ve always loved the boxes of assorted paper Valentines with little white envelopes that the kids fill out and give to their school classmates. Our kid’s teachers were always great about sending home a complete list of names so no one was missed or forgotten. Personally, I’ve always been fine to skip the giant bouquets of flowers, jewelry and heart shaped boxes of candy. My husband and I exchange cards, but that’s about it. On Valentine’s Day we usually skip the overcrowded restaurants to spend a quiet evening at home. But that doesn’t mean I won’t bake up something nice for him, hold hands and tell him how much I love him. After 31 years of marriage one thing I know for sure, all that is still very important. I don’t need him to spend insane amounts of money on me to know how much I am loved. However, if we were uber rich I might feel differently … just saying I wouldn’t turn down a super hot car or a fantastic African safari! You know, it’s the little things that make a relationship special! 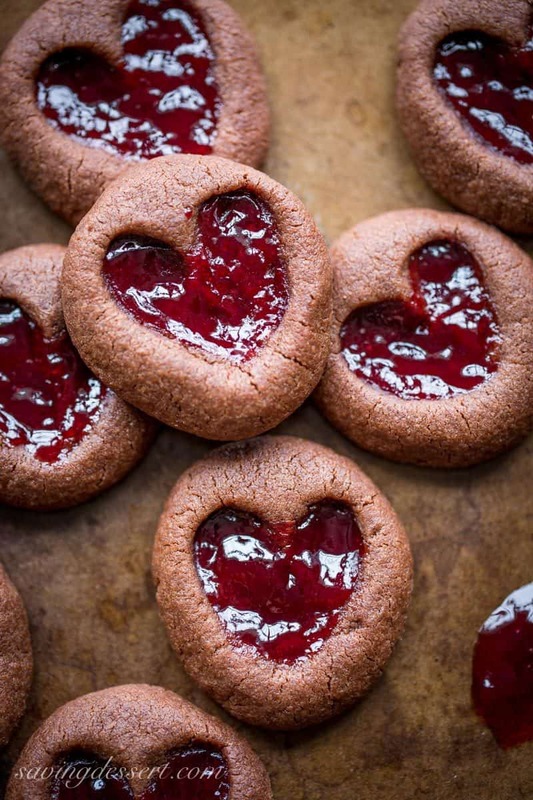 As for these delicious little treats I’m confident everybody on your Valentine list would enjoy these tasty, simple Chocolate Raspberry Thumbprint Cookies. It takes a little practice to make the heart-shaped indentation just the way you want it but after a few tries you’ll have it all figured out. If you’re not sure how they’ll look once baked, put a small batch of cookies in the oven before forming the remaining dough. Finally, one important tip – don’t go too deep when creating the indentations as that will cause the cookies to spread too far and not retain their shape. I used my pinky finger and pressed about halfway down. That seemed to work great! Chocolate Raspberry Thumbprint Cookies - who can resist the classic combination of raspberries and chocolate?! 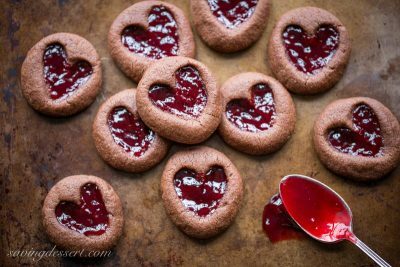 This little chocolate cookie boasts plenty of chocolate flavor and a fun little heart shaped thumbprint filled with seedless raspberry jam. Optional: fill with your favorite flavor of jam such as cherry or strawberry or a simple chocolate ganache or Nutella spread. Pipe an outline of melted white chocolate around the jam if desired. In the bowl of a stand mixer, beat together the butter and sugar until light and fluffy, about 5 minutes. Add the egg yolk and vanilla and blend until the yolk disappears. In a separate medium bowl. whisk together the flour, cocoa powder and salt. Add the flour mixture to the butter and sugar. Mix on low until combined, then blend on medium for about a minute. Scrape down the sides and bottom of the bowl as needed with a rubber spatula. Blend another 30 seconds to make sure the all the ingredients are combined. Using a small cookie scoop (about 1 1/4" wide - 2 teaspoons) roll the dough into tight balls and place about an inch apart on the prepared cookie sheet. To make the heart shape, use your smallest finger and make two indentations into the dough ball. Don't push your finger all the way through the dough as this will cause the cookie to spread too much and not hold it's shape. 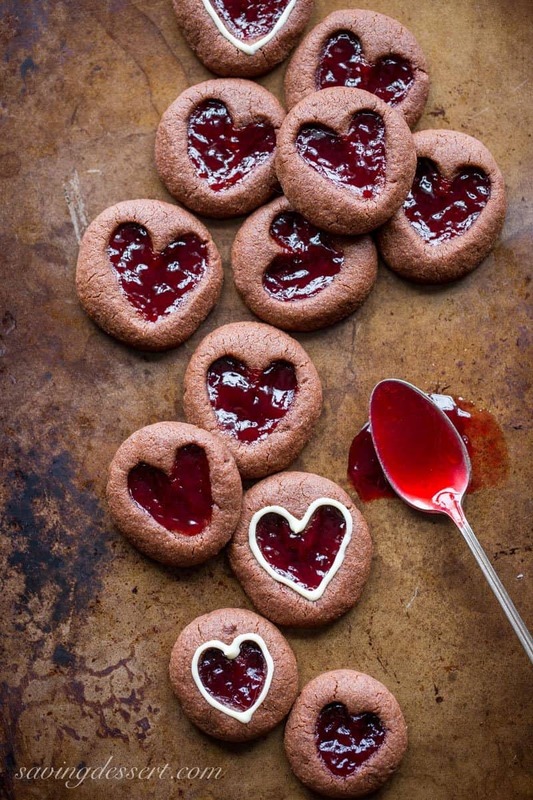 Fill the raw cookie with 1/4 teaspoon of raspberry jam. Bake for 12-15 minutes or until the jam is bubbly and the cookies are puffed and set. Remove from the oven and allow the cookies to cool on the baking sheet for 3-5 minutes, then remove to a wire rack to cool. Store the baked cookies in an airtight container at room temperature. Use wax paper between layers if necessary. Important tip - don't go too deep when creating the indentation as that will cause the cookies to spread too far and not retain their shape. I used my pinky finger and pressed about halfway down. Do not over-bake the cookies or that will also cause them to spread too much. 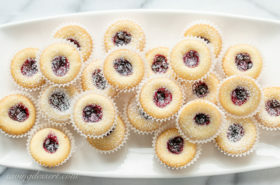 Here are a few more thumbprint cookies you might like! Has the baking soda or powder been left out in purpose? Hi Maria. I never included those items in the recipe. These are fabulous ! 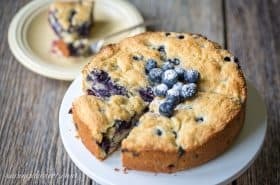 Thank you for the recipe!!!! We just made Christmas Jam with my aunt and so I wanted a recipe where I could use it. This was perfect! Thank you try much Jordan! Yeah – very glad you liked them – and homemade Christmas jam sounds wonderful. 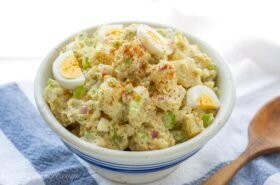 Have a blessed holiday season and thanks for trying our recipe. Anything chocolate goes over well at my house. 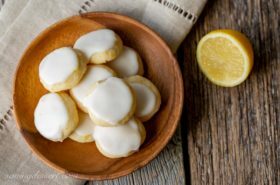 Such a clever twist on an ordinary thumbprint cookie—they look irresistible!! 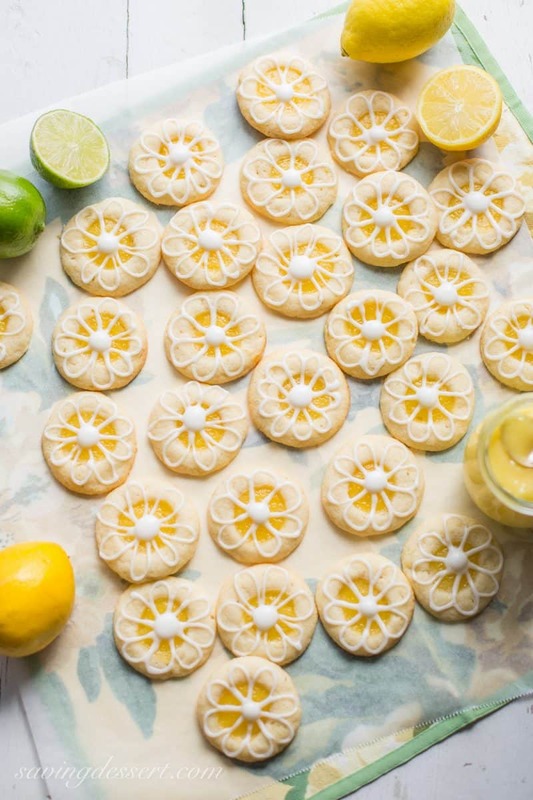 Wow, Tricia, you can even make thumbprint cookies look elegant, lol – gorgeous! I love the combination of raspberry and chocolate flavors! What an adorable idea to make heart prints ♥ Love it! Your cookie are always the prettiest. And I’ll take the African safari any day, but I’d sure like some of these cookies to tide me over until that day comes! What a cute cookie! Love those heart indentations — very clever. And great combo of flavors. 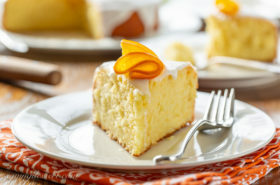 Really ideal dessert for Valentine’s Day. Thanks! These are just the cutest thumbprint cookies ever. Chocolate and raspberry is such a great combination. I know you love to have fun with baking so these are right up your alley! Thank you so much for stopping by Wendy! These are beautiful, Tricia! Perfect degree of Valentine, in my opinion. : ) We don’t go crazy but Valentine’s Day does bring a smile to my face and as you said, it’s so sweet for kids. This is such a pretty way to present that always-delicious combination of chocolate and raspberry. Thanks Monica – you’re right – we don’t need to go overboard for the sweet sentiment to be obvious 🙂 Thank again! Hi Tricia, these are straight-up gorgeous, love the combo of chocolate and raspberry. These are perfect for Valentines Day! Thanks for sharing and pinning Sue! Have a wonderful day! That sounds like a lovely Valentine’s Day – hope you get to spend at least part of it with your little men! 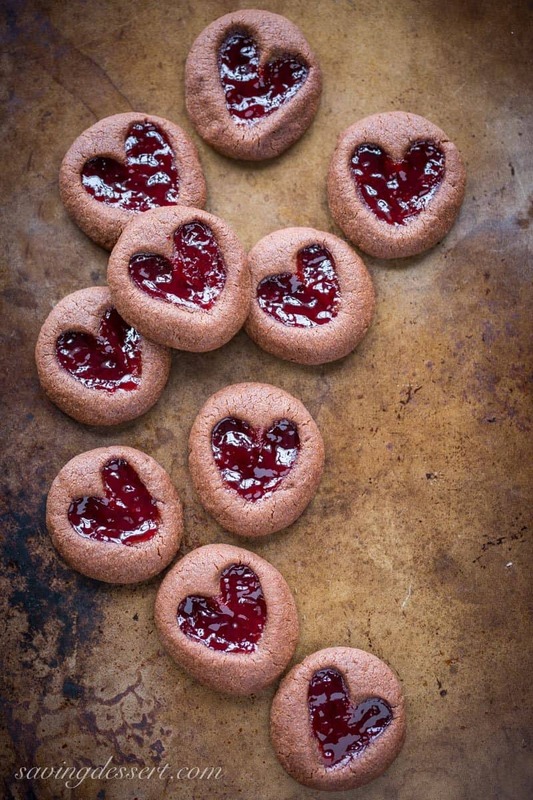 These thumbprint cookies look so gorgeous! My husband would surely LOVE these if I baked for him. Husbands seem to love it when wives bake for them! Hope you give them a try Angie – thanks!